bumps to cross the field. In the middle of each of these bumps were towers. In the last 30 seconds of the match, robots could try to hang from these towers to score bonus points. Our team consists of 41 students and an abundance of mentors. Check out our 2010 scrapbook. Our goal for Breakaway was to be a powerful scoring robot. We were able to score balls in the goals quickly and easily. We could also deflect returning balls into our alliance zone. The robot could also hang, but not consistently, and that was not a major part of our strategy. We would instead use the end game time to continue scoring. 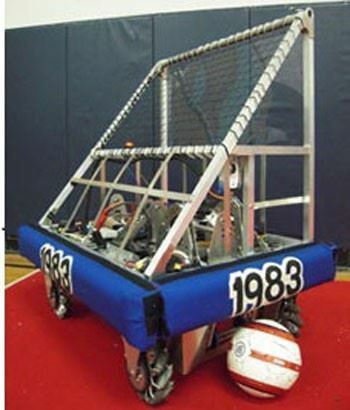 The robot, named Pele Le Pew, was built for scoring. It had a spinning pipe wrapped in rubber that could trap the ball and center it in front of the kicking mechanism. The kicker itself was pneumatic powered. It could kick accurately and quickly. The wedged top of the robot had a net strung across it to deflect balls, as they rolled off of the ball return, into our scoring zone. We used a mecanum drive base to move the robot. This drive base was useful while driving on the bumps and lining up to score. The mecanum drive arrangement allowed the robot to move from side to side without changing orientation. The robot had two arms that it could hang with, but they were not used very often. 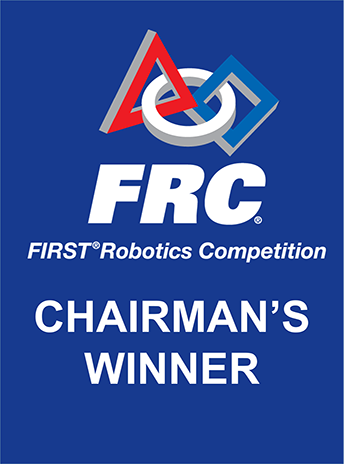 We were able to achieve a rank of 12 out of 64 teams at the Microsoft Seattle Regional, where we also won the Regional Chairman's Award allowing us to go to the Atlanta Championships.